Inspired by the award-winning tabletop game, Evolution retains the elements which made the analog edition so popular with more than 1.6 million players worldwide, but offers a swift pace and features only possible in a modern video game. 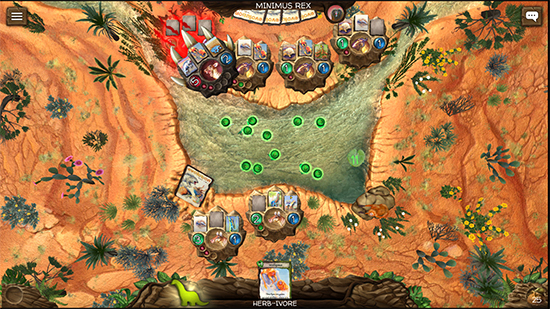 Meticulously designed so even those who are completely unfamiliar with the original board game can jump in right away, the digital release features a learn-while-you-play tutorial, exciting campaign mode with Apex Species opponents to test your wits against, and cross-platform multiplayer that effortlessly matches players with others of similar skill. Create new species and adapt them for survival in an ever-changing environment, brought to life with a beautifully hand-painted, watercolor art-style and an earthy, contemplative original soundtrack. Combine different traits rooted in science, such as a long neck or a defensive shell, in limitless combinations to help creatures thrive in the fight for survival over scarce food resources and defense from deadly predators. Develop symbiotic relationships or even evolve carnivorous traits and feast on foes in this addictive turn-based strategy game. 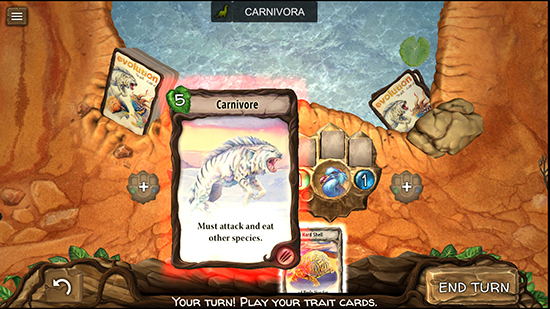 Evolution brings stunning new artwork, animated cards, lush environments, distinct enemy A.I., and more than 24,000 possible species to the virtual table. The campaign presents varied scenarios and smart “Apex Species” requiring careful planning and strategy to survive. Take survival of the fittest online and square off against live opponents around the world in fully cross platform, skill-based matchmaking. Rank up from a field researcher all the way to a Nobel Laureate in the progression system. Test yourself against others in the ongoing seasonal tournaments. Turn-based and simultaneous play options allow for fast and fluid multiplayer games in under ten minutes. Evolution: The Video Game is available in English on PC and Mac via Steam for $14.99. It is also available as free-to-try on iOS and Android with a full version available for $9.99 as a one time purchase. Those who purchase the game in the first week will receive a 20% launch sale discount.